The Hallmark Channel just recently moved The Brady Bunch from 5-8pm to 2-4pm on June 10, but now after two weeks in that block...it is going to be removed. Maybe the Brady kids got in trouble for playing ball in the house? Starting Monday, June 24, 2013, The Hallmark Channel will remove the two-hour Brady block and add an extra episode each of drama staples The Waltons and Little House on the Prairie, so both of those dramas will now air three hours in a row instead of two hours. The Waltons will now air from 2-5pm, while Little House on the Prairie will air from 5-8pm. 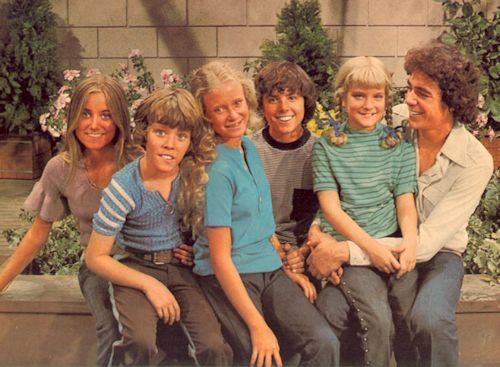 The Brady Bunch will now join Happy Days on shows placed on hiatus. Both series joined the network in January. No word on if and when The Brady Bunch will return, but it is not on the schedule elsewhere on Hallmark either. Oh, Mike. The rest of the Hallmark Channel line-up will remain the same as it is now. The Brady Bunch will still be on television at least, if you get INSP and MeTV Network. Cable network INSP airs the sitcom weekdays at 5:00pm & 5:30pm, while MeTV airs The Brady Bunch Brunch Block on Sunday afternoons from 11am-1pm. Stay with us for continued updates and we hope it returns soon...enjoy it the next three days before it is off the schedule starting on Monday. NBC News announced that it has greenlit an exclusive, hour-long documentary chronicling Valerie Harper's (Rhoda, The Mary Tyler Moore Show) battle with a rare, terminal cancer. Hosted by Meredith Vieira and produced by NBC News' Peacock Productions, this first-person account captures Harper's raw, emotional and hopeful journey as she goes through experimental treatments and lives each day to the fullest with her husband Tony Cacciotti and their daughter Christina. A recurrence of Harper's 2009 lung cancer, the disease spread into the membrane surrounding her brain and she was diagnosed with leptomeningeal carcinomatosis on March 6, 2013. Since then, she has allowed camera crews unprecedented access into her life to help tell her story - every step of the way. From the revelation that she had an incurable disease, to doctor's visits, second and third opinions, surgeries and reunions with family and friends, the documentary, airing on NBC in primetime, takes an intimate look inside Harper's reality. Air date and additional information regarding the documentary airing on NBC, to be announced.